In my last post, I reacted to the question "Who Should Own Social Media." I won't attempt to minimize this topic, as I believe there's a great need for discussion here. As a consultant in this arena, I'm currently helping two large clients put together different operational models to help lead and guide web and social business within the enterprise - and they're both doing it very differently. There's some rich discussion going on around the different operational models that can be applied to support digital media, especially in light of the subject of social CRM... and I hope to talk about these in future posts. But first, Horse, Meet Cart. While this is all very pithy stuff -- taking the issue of ownership without addressing the organization's need for a comprehesive understanding of (and strategy for) digital and social media is putting the cart before the horse. Good operational models (and ownership strategies) are designed to be facilitative, by nature. That is, they're designed to help the organization collaboratively drive desired business goals and respond to people's needs in a timely, satisfactory manner. So, when we talk about who should own the model -- and whether our ownership model should be distributed, centralized or coordinated, we are really trying to define an end result that should be an outcome of a solid strategy and tactical plan. The most successful companies in social media have shifted emphasis away from tools and the issue of "ownership" to emphasize the experiences they are creating for various audiences in the digital space. These are the companies who are learning how to effectively extend their businesses in digital channels. They are the companies that are realistically and innovatively positioned for the future. These are also the ccompanies who are effectively managing to drive better outcomes. And across the board, they are the companies who are grounded in the understanding of their current state: they know where they are -- and where they are going. While many companies think they understand their present state and experiences well, objective, third-party analysis often proves otherwise. I've encountered more than my fair share of companies that don't even have an accurate ready inventory of the digital access points (sites, apps, tools, etc.) they currently manage. They're usually shocked when they conduct a count -- and usually have to add a list of "stragglers" at some point - especially in the areas of "tools" that help manage and monitor digital, social and mobile media. Beyond the numbers, this lack of grasp on digital media means these companies are highly likely to possess an immature perspective of the time and resources required to properly manage these properties, an unclear picture of who is managing them, and an unreliable set of metrics that will tell them how these properties are performing. This makes determining how to move forward strategically (much less in an "integrated" manner) pretty difficult. Perhaps more importantly, many of the same organizations fail to understand the experiences people are having within and across these digital properties, and how those experiences drive business results and satisfaction. This includes the provision of "free" or value-add content (webinars, white papers, tips, etc.) to prospects, and allowing people to accesss purchasing or post-sale service and support. To combat this lack of understanding, a current state assessment can be a highly useful tool. In short, this examines what we've built, how people are responding to the experiences we offer, and how we're managing things today and can consist of a number of tasks. What Does a Current State Asesssment Entail? As food for thought, here is a list of some of the exercises a Current State Assessment may include. Lest you be overwhelmed, think of this as a Chinese menu - you don't have to do it all -- just pick the right exercises to fuel forward progress. You can right size the work based on your budget and goals. Just make sure you keep the assessment of your audience's needs and experience at front and center of your activities. With a clear understanding of our current strengths, weaknesses, opportunities and risks, a company is well informed to develop a grounded, future state vision. The company's strategy and long/short-term planning wraps around this vision, includes not only our go-to-market approach but an operational model and plan that will align and support the organization (owners and contributors) in delivering and measuring the digital experience. This fuels solid delivery and helps the organization collaboratively coordinate, plan execute, measure and improve digital media in an ongoing manner. What Benefits do Current State Analyses Drive? 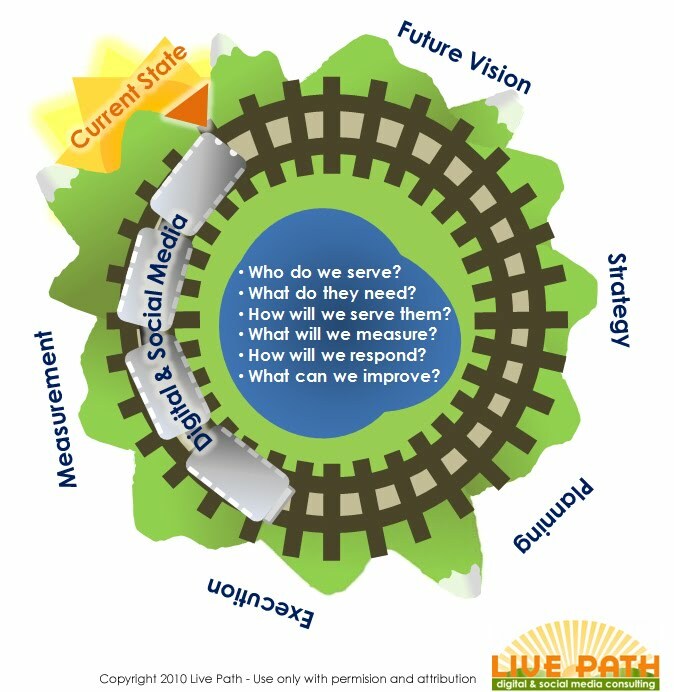 As we gain this realistic picture of how we currently serve others, motivate desired behaviors and drive desired business outcomes, we become much more clear minded about our future approach, in a manner that is grounded by, but not limited to, the reality of the present. Can We Develop an Objective Current State Using Internal Resources? As a consultant who is often hired to bring in fresh perspective, usher in people-centric insight, I readily admit my own bias in answering this question. Having worked on both the client and consulting sides, I have found it difficult to manage bias on internally executed projects -- especially ones managed by a department or division within a single area of the business. The natural alignments and perspectives people have as corporate employees with various levels of "skin in the digital game" - makes it very difficult for internal resources to be objective across the board. Again, what we're trying to do is look unilaterally at what we're doing across the organization and view it fairly and objectively -- and align resources to deliver better. To do this right, it's essential to neutralize bias - even the perception of bias. Otherwise we can undermine results as well as organizational collaboration. While I do think that companies can be objective in some areas, and there are tasks that can be internally managed or collaboratively executed, I am usually a proponent of bringing in an third party agency or consultancy to help. I'm also a fan of using objective research methodologies to evaluate the current state, audience sentiment, and existing CX. Contrary to popular opinion, this doesn't have to cost much, and doesn't require a huge team of resources. In fact, obtaining outside perspective can be a highly effective way to burst bias bubbles and bring business stakeholders into a more reality-based, aligned, collaborative state of mind. It's also a great way to break up "analysis paralysis" and "he said, she said" logjam inside the organization. Have you done a current state asessment on your digital media approach? How do you balance your need to be tactical (execute) and strategic (plan/improve for future)? How are you structuring to support your footprint? When are you bringing in third-party agencies or consultants, where has support been most valuable? Where do you insist on managing things internally? How do you manage internal bias or "silo-based thinking" so that it doesn't compromise your digital experience?